Congrats on Top 10!!! Fiery, dramatic and wonderful detail! Once again an outstanding entry! Well done! Was this an IR shot? I would love to know your post-processing steps for this one! Great photograph! Sue! This is BEAUTIFUL! Harsh never looked so stunning! CONGRATULATIONS not only on such a fine finish -- but on such a stunnign photograph! Wow! This is too beautiful for words. Excellent work, Susan. This is a great great picture - the sky is awesome!!! When I saw this sky, I thought that it may be your image. Beautiful image, and congrats on the excellent finish in the challenge. One of my favorites for this challenge. Amazing post production, but the horizon line seems not to be straight. Godd anyway, 8. Wow, the approaching storm really speaks out with the colours. One of my favorites. For me, your image seems highly over processed, but again, that's just me. My pick for ribbon. I like the PP and composition. Good luck. This is just amazing! Wonderful detail and color! 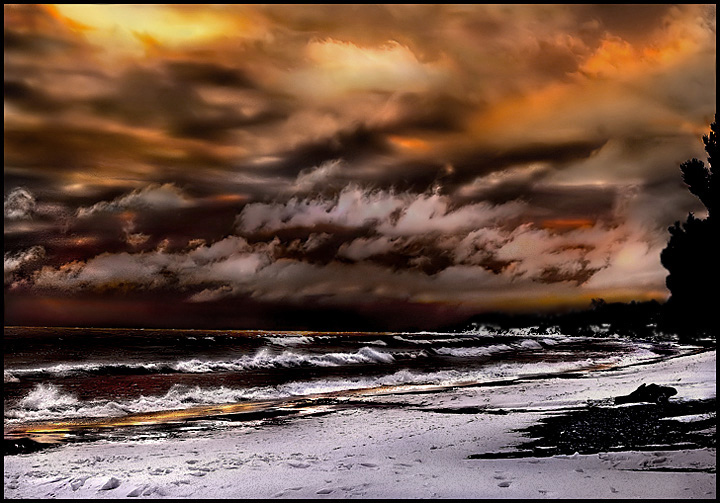 Very dramatic, love the colors, reminds me of a painting we had when I was young. Nice composition, and challenge take, 9. This is stunning. Unable to vote but this would make my top ten. Beautiful PP with the sky. Proudly hosted by Sargasso Networks. Current Server Time: 04/20/2019 02:49:31 AM EDT.